Since its foundation in 1993, Cochrane has set the standard for medical research-synthesis publications . Systematic reviews with or without meta-analyses are the core of such syntheses and are the foundations for evidence-based practice guidelines and policy. Cochrane reviews of interventions aim at including outcomes that are likely to be important for patients, clinicians, the general public, guideline developers, administrators, and policy makers . Cochrane states: “It is critical that outcomes used to assess adverse effects as well as outcomes used to assess beneficial effects are among those addressed by a review” (chapter 5.4.1) . This issue is important, because a balanced perspective of an intervention can only be obtained when both types of outcomes are assessed and reported with the same rigor. Cochrane has formulated the following definition of an adverse effect: “An adverse event for which the causal relation between the intervention and the event is at least a reasonable possibility” [4, 5]. 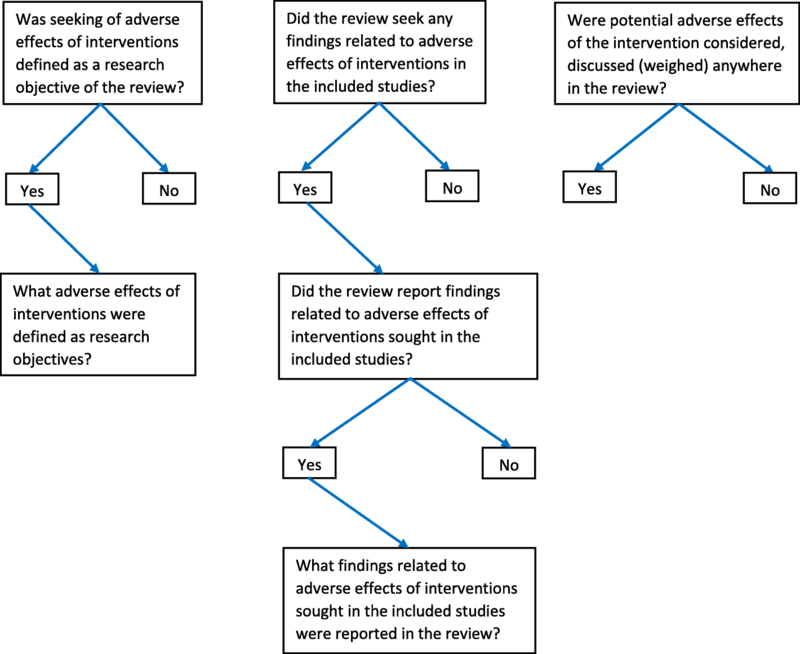 We adopted Cochrane’s definitions of adverse effects, systematic reviews, and interventions reviews in this manuscript (Table 1) [4–6]. Numerous epidemiological studies have shown that adverse effects of interventions are often under-assessed or under-reported in primary research studies [7–11]. In addition, much information on adverse events remains unpublished and the number and range of these events are higher in unpublished compared to published versions of the same study . To improve the reporting of harms in randomized trials, an extension of Consolidated Standards of Reporting Trials (CONSORT) Statement was developed . The reporting of adverse events has improved over time since the publication of this extension, but was still suboptimal for a wide variety of clinical trials [9, 11, 14]. Systematic reviewers have an important role in bringing these issues to the foreground. However, epidemiological studies have shown that seeking and reporting adverse effects of interventions is also suboptimal in systematic reviews [15–18]. In 2016, the Preferred Reporting Items for Systematic reviews and Meta-Analyses (PRISMA) harm checklist  to improve harm reporting in systematic reviews was published, but the consequences of this checklist are still unknown. In this research study, we will assess whether adverse effects were sought and reported in both Cochrane and non-Cochrane systematic reviews of orthodontic interventions. This is important, because of the following: (1) The validity of the findings of systematic reviews of interventions depends on a balanced presentation of both the benefits and adverse effects of the intervention . (2) There is a large body of evidence that has demonstrated that seeking and reporting of adverse effects is suboptimal in a wide variety of clinical trials [7–11]. Systematic reviewers can have a crucial role as whistle blowers by bringing these knowledge gaps to the foreground. However, their position can also be damaging, because reviews that present an incomplete picture on these gaps can have unfavorable consequences for the end-users. For example, not reporting that no adverse effects were assessed in eligible studies included in a systematic review can mislead readers.